Government Doon Medical College, Dehradun released a notification for the recruitment of Professor, Assistant Professor & Associate Professor posts. Interested and qualified candidates attend the walk-in on 08 July 2016. This recruitment is purely contract base. 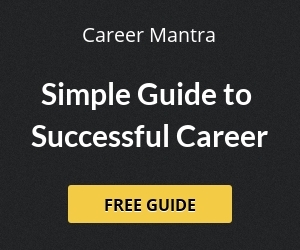 Candidates who fulfil all criteria will further call for the Interview. Final Selection will be based on Interview only. Interested candidates can download the application form from www.doonmedical.com and filled it with all true information. Application form shall be submit online on doonmedicalcollege@gmail.com before the date of interview. 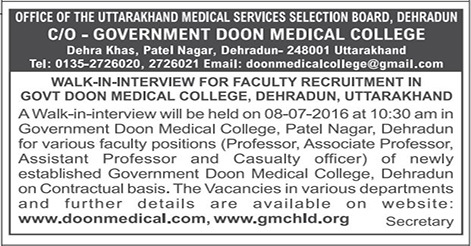 Interview will be held on 08 July 2016 at Government Medical College, Dehradun on 10 am. Help us to improve this article/job posting "Professor & Casualty Officer Recruitment in Uttarakhand Medical College Dehradun". We would be glad if you can comment below and provide your valuable suggestions and feedback. If this page have any wrong information/list or out of context content, then you can report us as well.